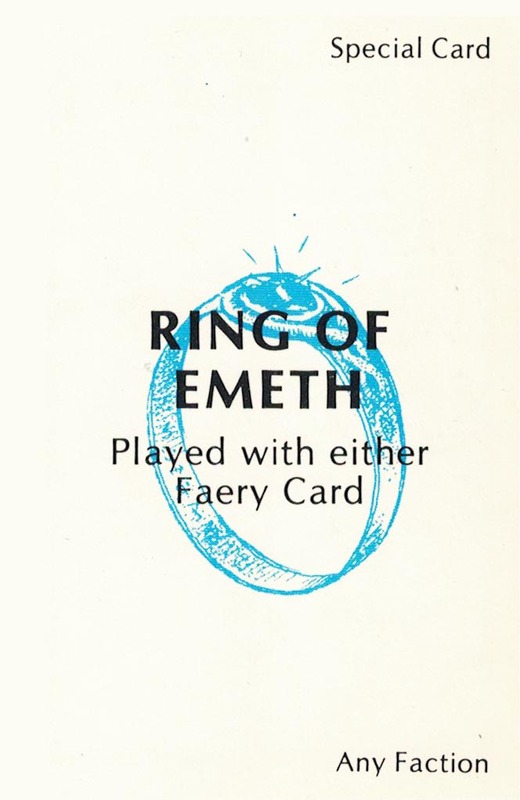 The Special Card, “Ring of Emeth” from the JASMINE: The Battle of the Mid-Realm Collector Card game. “We need to get that evil thing off of you.” Glynn said with a sense of urgency. “Yes! I know! But those details don’t matter right now. What’s important is this dragon-lizard is attracted to the ring! I think it’s the real reason Bardulf placed it on my finger. So he can track me down using a dragon for a blood hound! Fortunately, he could not track me in the underground caverns, nor at the underground temple, and less so when I was alongside a river or a stream. This revelation made Glynn uneasy. He looked around the camp suspiciously. Jasmine reassured him that the little dragon would not hide. Instead, it would probably announce itself immediately upon it’s arrival with a loud, thundering squawk. That bit of news did not make the dwarf feel much better. Wanting to suggest something a little more uplifting, Jasmine ventured, “Before the little dragon arrives, I plan to obtain advice about him from the winds.” That bit of information did not stir him either. Jasmine finally thought of a good way to lighten the atmosphere. She laughed, “Isn’t it wonderful to share a space where three extra people aren’t glowering, suspicious, and charged up about each other?” Glynn finally shared her laugh. He too, appreciated the stillness of having no negative vibes or heavy emotional residue to interrupt or disturb peaceful slumber. Yes, nodded Glynn. Without the silent clamor, it will certainly be harder to stay vigilent while those goons are away. Still, he could read the night much better without their interference. They tended to affect the electrical bio-field surrounding them. He read there was danger all around. Nothing new there. After a while, Glynn convinced himself, that the three’s psychic noise would have an effective repelling quality on any mental probes directed their way. It certainly had a negative effect on him! Without the “bungling shield” created by the three, as Glynn laughed to call it, we’re now more prone to being found. He thought of a modest solution to try. He emptied a small sack of its contents, scooped up dirt and rocks to fill it. He wetted the mixture with his canteen and made a muddy paste. Then he awakened Jasmine. “Here,” he said as he pushed the dirty sac towards the bleary-eyed girl. He took her hand and submerged it in the bag. The feel of mud on her fingers instantly shocked Jasmine into wakefulness. She responded by jerking her hand away. This entry was posted in Jasmine & Role Playing Games, The Creative Process and tagged bio-field, dimensions, Glynn, Jasmine, Order of the White Flower, portal, The Story of Jasmine on May 4, 2018 by Darlene. 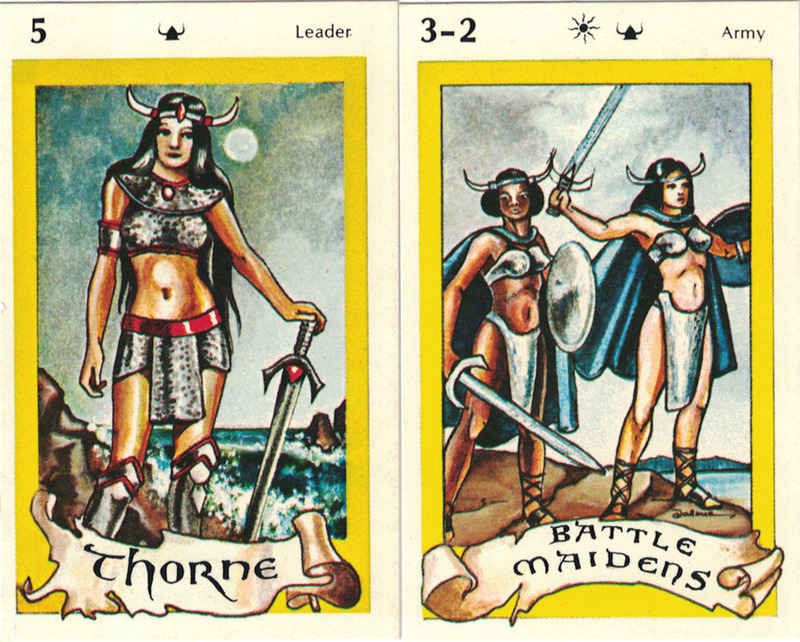 Two cards from Jasmine: The Battle for the Mid-Realm collector card game. The moment Thorne spied Gavin, she knew something serious was up. She disentangled herself as fast as she could from her traveling companions and followed the hawk. She chris crossed her path, in case Rogan would try to locate her tracks. When she finally returned to the road, she picked up speed as she turned her stallion loose to run. This is where her horse, Mindy, excelled. None was faster. Even Rogan’s stallion, who proved to be a worthy horse, could never best Mindy in a race. But they never raced. Thorne wanted to keep her horse’s exceptional penchant for running all to herself. At last, the bird landed in some trees next to a clearing where there were three battle maidens waiting. “Ambassador Thornekill?” queried the rider in the middle, “Oh Ambassador! Praises be, we caught you in time!” Thorne recognized the voice of the maiden with the copper-colored hair. Thorne accepted their hospitality. It wasn’t long before she was eating diltsfef wrapped in flat bread. How long was it since she enjoyed diltsfef? In between savored bites, Thorne listened. She understood that the Northern road had just been compromised by Melantha’s forces. The Armildians did not want any of their own to fall into her hands, and especially not their Ambassador. Clara chose Gavin, a trained hawk she knew Thorne was sure to recognize, to intercept her before her party took that road. Clara’s plan worked. “Oh him? Rogan is … Rogan. I took steps to assure he could not follow me. But he still has a place in our party. I am traveling with three others besides Rogan. And I believe the daughter of King Aranbrod of UR is among them. She has a dwarf protector, probably a mercenary, Glynn Oakenshield and there is a Dockalfarian royal of all things! I find it hard to believe we are all together by happenstance. When Thorne finally gave in, Clara was triumphant, “So now, rest, stretch your muscles and replenish yourself. Have some more diltsfef.” She started humming an old Armildian folk tune, which immediately relaxed Thorne enough to allow herself a full glass of chewy beer. “Those types follow orders. Soldier men can’t think for themselves. Men are creatures of habit, they’d assume they were following you north. They will not take the time to vary their intended course.” Clara’s chatter was quite persuasive, especially when the light struck her hair in places to shine the same honey-color as her eyes. 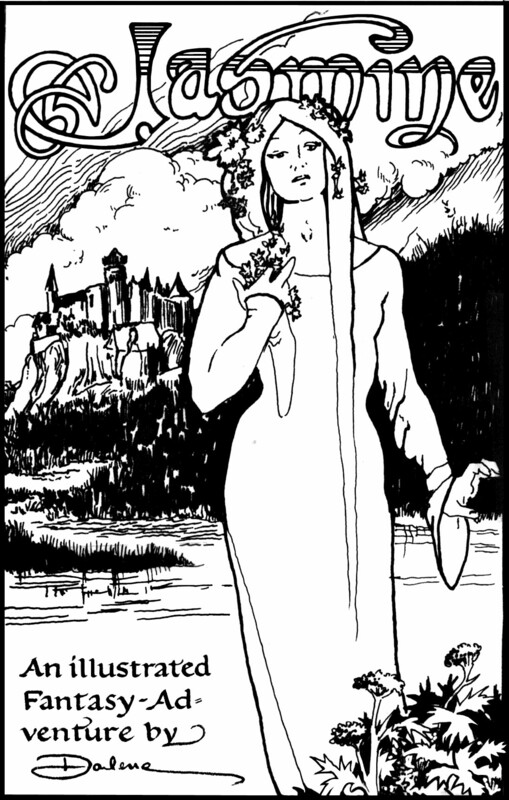 This entry was posted in Jasmine & Role Playing Games, The Creative Process and tagged Armildian Battle Maidens, Battle Maiden, Clara, diltsfef, Gavin, Jasmine, Mayzelle, Order of the White Flower, Rogan the Red, The Story of Jasmine on May 2, 2018 by Darlene. Jasmine made a slow ascent to the ancient ruins of the temple on the mountain known as The Great White Throne. Although she was tired, with each step, she felt the weight of her past drop away. Mulling over all the confusing things the Guardians told her during their journey within the underground passage, she recognized one truth. She could never go back. She could not retrace her steps. There was no returning to life as a princess in her father’s castle. There was no where to go but onward, into the unknown. The moment she realized this became the moment she took her life into her own hands. This is when the princess ceased to be a princess and became Jasmine. Even though her pampered life had never prepared her to make decisions for herself, she somehow felt wiser. Her rumination was interrupted by something out of the ordinary Jasmine thought she heard. She stopped in her tracks and craned her ears. What in the wind was whispering a warning? She heard the gurgling of a small stream nearby and left the path to head for it. The Guardians told her water diminished the ring’s effect upon her. She dunked her hand in the stream’s cold water to dilute its potency. As the ring lost its gleam, Jasmine sensed danger. For a long while, under cover, she stood perfectly still and quiet before the stream. As she waited, from between the trees, she studied the outlines of the walls that crowned the next rise not far from where she stood. As the last light of the setting sun receded into shadow, Jasmine watched the foliage sway in the gentle evening breeze. The rising moon illuminated the ruins of a once columned structure. Though she had never been here before, everything seemed somehow familiar. Then it hit her. Could this be the place Ermengarde described in the stories she told? Ever since she was little, her foster guardian, Ermengarde, had captivated her with stories of the wondrous Order of the White Flower who lived in a White Temple on a White mountain. Her fantastic stories always had memorable descriptions, down to the smallest detail. If it truly was this place, then she knew everything there was to know about the Temple, even its secret passages. If real, those were happier days. Even though Ermengarde had always described it as a safe haven, what was left was in ruins. And it wasn’t safe. There, in the cold light, she detected some movement and saw a figure of a man. But she was too far away to note any more detail. To move in for a closer look, she cautiously stepped in the shallow stream, which came up to her ankles and waded against the current. She knew the stream would led her somewhere above the temple. Taking this route did not pose a risk. Each step she took was sure-footed and confident, as if she had moved in procession in this very stream many, many times before, in unison with her beautiful story sisters under the light of the rising moon. Eventually, her vantage point became such that she noted several men hiding among the broken pillars. Their complete attention was directed towards the pathway. She would never have seen them had she taken the trail. They appeared to be soldiers. 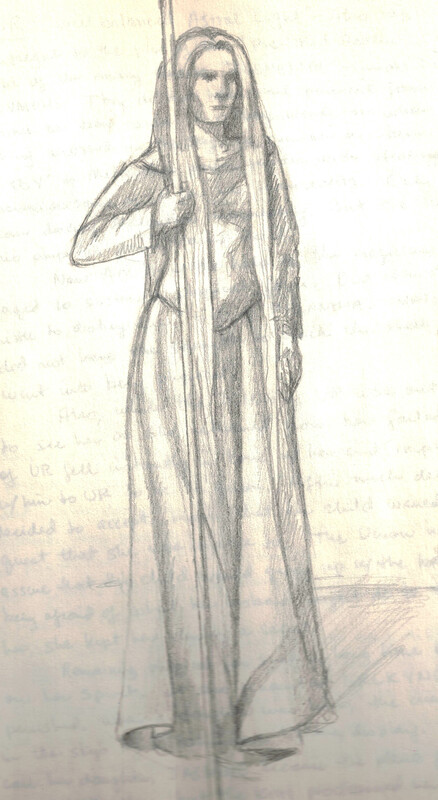 At least they wore the clothing of Bardulf’s men. Had she arrived from the pathway, they definitely would have surprised her and taken her captive. This entry was posted in Jasmine & Role Playing Games, The Creative Process and tagged Great White Throne, Jasmine, Order of the White Flower, The Story of Jasmine on March 22, 2018 by Darlene.